According to the buzz in the film industry, when Puri Jagannadh approached Amitabh Bachchan for a movie, the superstar liked the concept so much that he offered to produce it. This gesture, along with the colourful title, made Bbuddah...Hoga Terra Baap one of the most awaited movies of the year. Releasing on the same day as Transformers 3: Dark Of The Moon and Delhi Belly, Bbuddah...Hoga Terra Baap is a strong contender for 'Blockbuster Of The Season'. Kabir (Prakash Raj) is a flourishing contract bomber, but his business is threatened by ACP Karan (Sonu Sood), a young police officer who swears to clean up the criminal garbage in Mumbai. Offended by the word 'garbage', and realising his mortality, Kabir asks his right-hand man Anju (Shahwar Ali) to hire a hitman to kill Karan. Enter Viju (Amitabh Bachchan), fresh off the plane from Paris. He swaggers into the country in linens and scarves, and makes it clear to everybody that he does not like being called an old man. He rents a room in the city, and befriends Amrita (Charmme Kaur) and her friend Tanya (Sonal Chauhan), and hangs out with them at discotheques and coffee shops. He also rides a Harley Davidson and follows Karan around. Turns out that Karan is in love with Tanya, and Viju now has direct access to him. The first half of the movie drags on with a paper-thin plot and script, some inane scenes and bad production design. But suddenly, just at intermission, a twist emerges, and the story becomes interesting. Before the credits roll, a public letter (from the director to Amitabh Bachchan) is flashed on the screen, where Puri Jagannadh mentions that having grown up on Bachchan blockbusters, he wanted to see his favourite actor in action one more time. And how! 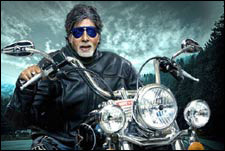 Amitabh Bachchan swears in beeps, shoots bullets (with both hands) around pillars, dances to a remix of some of his old songs, wears leather jackets, whistles, laughs, fights and jumps, without apparent fatigue. He is the only one who could have pulled it off, given his age. This is a Bachchan flick through and through, and the other actors seem to be placed to give the audience a break from too much of a good thing. To be fair, Hema Malini is sublime in her role. And Prakash Raj is the perfect antagonist to Viju. Nobody else could have carried off the perplexed-yet-menacing act that he has become known for. Subbaraju plays Kabir's left-hand man, and he is genuinely funny, more than Shahwar Ali. Raveena Tandon is a tad over-the-top, and it is a little difficult to digest her role as the mother of a grown-up girl. Charmme Kaur is bubbly and fun, and she plays her small part with aplomb. Sonal Chauhan has one expression throughout, and her role is quite superfluous. Sonu Sood tries his best to outshine the Big B, but, let's face it, there can be only one alpha-male in such scenarios. The climax fight sequence and the events leading up to it make the movie worth watching again. Makrand Deshpande has an emotional moment with Amitabh Bachchan in this sequence, and he plays his role superbly. Amitabh Bachchan has sung quite a few songs in Bbuddah..., and that makes the music so much more interesting. Look out for the poignant 'Haal-e-Dil', in the Big B's own voice. Bbuddah...is for all those Bachchan fans who have wanted to see their favourite in a role reminiscent of Don, Sholay, Deewar and others. It is also for a generation that knows too little of the man who hosts Kaun Banega Crorepati. If the movie does well at the box office, it will be Amitabh Bachchan's first solo hit in more than 2 decades. And what better way to welcome his grandchild into the world? fullhyd.com has 700,000+ monthly visits. Tell Hyderabad what you feel about Buddha Hoga Tera Baap!